Skull jewelry is once again becoming popular. 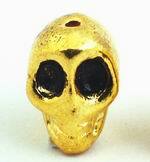 Especially with the young, who wear skull rings on their fingers and hang skull pendants on their bags. The media adds to the craze with many celebratory discreetly showing skulls. Originally skull jewelry was only a Tibetan Buddhist thing. Skulls have a negative context in Western culture, but to Buddhists they remind them to focus on reaching Nevada. The ultimate rebirth, when one finally escapes the suffering of terrestrial life - the final goal of their cycles of death and rebirth. Seeing skulls prevent Buddhists from wasting time building their ego or wealth, all of which becomes useless upon death. Modern gothic culture has some similarities to Tibetan or Vajrayana Buddhist. Goths like to highlight suffering, so as to contrast from living and create an optimistic outlook. This similarity is rather like the oriental concept of yin and yang – opposite and constant flowing forces. Increase yin, and yang with decrease, and vice versa. Likewise, draw attention to death, and life with become brighter. To others, skulls remind that we all have to die. Skulls show that life is not permanent and are a symbol that we are all flirting with death. In this context they represent a quest to survive, a reminder to be careful. For the same reason hot-rodders hang a furry dice inside their cars. A sign of danger. In the world of rock music, skulls have always been worn by the stars. 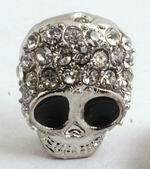 Every rocker sports a white metal skull ring, or a skull bracelet or necklace. Keith Richards of the Rolling Stones has worn a skull ring since the early seventies. Ozzy Osbourne and Axel Rose would never be seen without skull jewelry. To them skulls don’t just represent a fling with death, but a symbol of survival. Some link the skull image to rebellion, explaining why pirates fly the skull and cross bones. Outlaws to society want to show they live by their own values, and will not be forced into a way of thought by others who have an alternate and often immoral motive. Many people hate the way corrupt governments or greedy capitalists try to manipulate their hard earned cash. This reasoning leads to the wearers’ of skulls believing that they deter people from messing with them. Similar to old seagoing pirates flying their flag to frighten others away - and in conflict, the hope other ships would surrender without a fight. Whatever you think, there is no denying that skull jewelry is becoming the next big thing in fashion. Just look around to see for yourself. Sorry, we are currently sold out of 'Tibetan WaterBuffalo Bone Skull Bracelet'. Please check back later. Sorry, we are currently sold out of 'Unusual Bone Tibetan Skull Necklace'. Please check back later. Sorry, we are currently sold out of 'Unusual Tibetan Waterbuffalo Bone Necklace'. Please check back later. 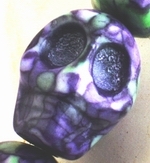 30 Unusual Summer Color Carved Skull Turquoise Beads - very popular!